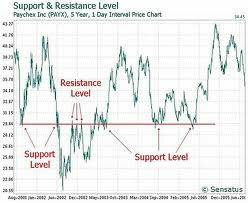 One of the fundamentals of trading binary options involves the use of support and resistance levels. They are plotted on a chart to help determine the direction in which asset prices are likely to head. You can imagine how useful they are when they have been plotted accurately. A lot of beginning traders – particularly those who are unaccustomed to charting price action – think support and resistance lines are complex. In reality, they are relatively simple. Once you understand them, you’ll have a powerful tool at your disposal for executing profitable binary options trades. Below, we’ll take a close look at using support and resistance lines to make smart trades. We’ll start with definitions and then work our way toward using this piece of technical analysis to make a consistent profit. It doesn’t matter whether you’re trading binary options for gold, stocks, or currency pairs. Making trading decisions based on support and resistance levels works. A similar binary options trading strategy can be used with an asset’s resistance level. But instead of executing a call binary option, you would execute a put option. This is done in anticipation of the price reversing and moving downward. Don’t scoff. This problem doesn’t merely trap beginning traders. A lot of experienced traders fall for it, too. Our advice is to learn how to plot and use candlestick charts (learn how here), and treat them with the respect they deserve. If you plot an asset’s price action carefully, there should be no excuse for misidentifying its support and resistance levels. As we’ve mentioned in the past, there’s no better teacher than experience when it comes to learning how to trade binary options profitably. There’s a lot of valuable insight to gain by placing trades that is not available in any other way. #4 – Don’t get lazy with your charts. The more you trade a particular asset, the more you’ll feel as if you know how its price will move. Be warned that binary options have a way of surprising even the most experienced traders. Intuition is important. But tracking price action, keeping accurate charts, and collecting reliable data are much more so. Bonus tip: we recommend setting up a few accounts at reputable binary options brokers that offer free demo accounts. TradeRush, 24Option, and Banc De Binary are great places to start. Get some experience by using the demo accounts to place risk-free trades. Then, jump in with a small bit of your own cash. Don’t be surprised if your binary options expire in the money.